Put the figs in a frying pan with the balsamic vinegar. Place over a medium heat and cook, tossing, for 2 minutes, until glazed. Add the cranberry jelly and cook for another 2 minutes till the figs are really sticky. Mix the goat's cheese with the herbs and spread on to the Krisprolls. 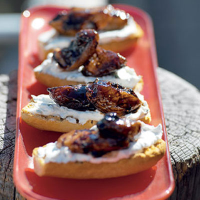 Top with a warm sticky fig and some pan juices, and serve.